VATICAN CITY (CNS) — Pope Francis paid homage to two Italian priests who were known for persevering in their priestly ministry despite facing opposition, even from within the church. 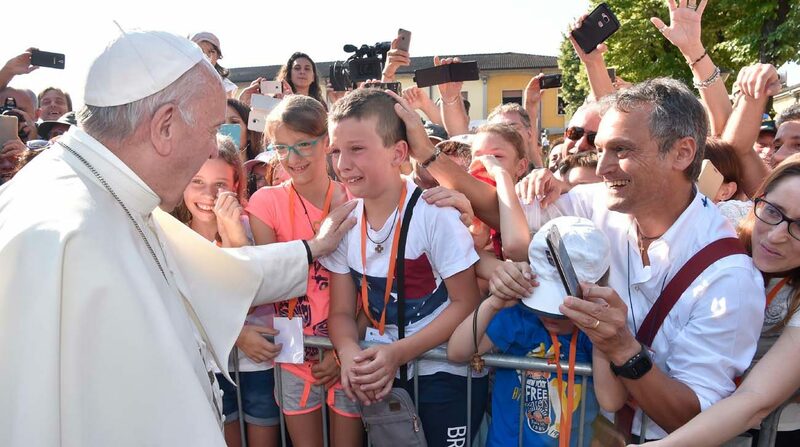 Visiting the towns of Bozzolo and Barbiana in northern Italy June 20, the pope prayed before the tombs of Fathers Primo Mazzolari and Lorenzo Milani, who dedicated their ministry to the poor and the oppressed. Pope Francis arrived by helicopter first to Bozzolo, where he greeted residents and well-wishers lined outside the church of St. Peter the Apostle, where Father Mazzolari’s remains were laid to rest. After praying in front of an icon of Mary, he went to the beloved Italian priest’s tomb, where he laid an arrangement of white and yellow flowers and stood in silent prayer for several minutes. Born in Cremona, Italy, Father Mazzolari was known for his steadfast opposition to Italy’s Fascist regime despite attempts against his life. Although his calls for increased participation of the laity, church reform and outreach to the marginalized were all themes that were at the forefront of the Second Vatican Council three years after his death, he was prohibited by the church from speaking publicly or publishing his writings. He would later gain recognition for his faithfulness to the church and was asked to preach in Milan by Cardinal Giovanni Battista Montini, the future Blessed Pope Paul VI. He was also praised by St. John XXIII who referred to him publicly as the “trumpet of the Holy Spirit in Bassa Padana,” referring to the area of Lombardy where Father Mazzolari carried out his ministry. He died in 1959. In his talk, the pope said he wished to meditate on the relevance of Father Mazzolari’s words and writings, although they were “not always understood and appreciated” during his time. Father Mazzolari “wasn’t someone who regretted the church of the past, but sought to change the church and the world through passionate love and unconditional dedication,” the pope said. Recalling Father Mazzolari’s call for priests to proclaim the truth not just in words but in deeds when ministering to the faithful. Citing Father Mazzolari’s words, the pope said priests are also called to help bring out the best in people and not demand perfection. “I want to repeat this and repeat it to all the priests of Italy and also the world: Let us have common sense! We shouldn’t beat on the backs of poor people,” he said. “In this way, we can become the poor church for and with the poor; the church of Jesus,” he said. After blessing the faithful in the church, the pope then headed nearly 130 miles south to the town of Barbiana, near Florence, to pray before the tomb of Father Lorenzo Milani, whose establishment of schools for all children, regardless of their religion, was initially criticized within the church. His “radical” dedication to education, he added, was “the concrete way in which he carried out his mission. “Give back the word to the poor because without the word there is no dignity and thus no liberty or justice: this is what Father Milani taught. And it is the word that can open the path to full citizenship within society, through work and fully belonging to the church” with greater awareness of the faith, the pope said. Educators, he continued, have a “mission of love” in guiding young people not just in learning, but in developing their freedom of conscience. “This is an appeal to responsibility. It is an appeal that involves you, dear young people, but first of all, we adults, who are called to live the freedom of conscience in an authentic way, as a search for the true, the beautiful and the good and ready to pay the price for what it entails. And this without compromise,” he said. Two good role model priests to learn more about their lives. Hopefully theology academics will write biography (in English) of both men and make them more well known outside Italy. I must admit being far from Italy this is the first time I heard of either.